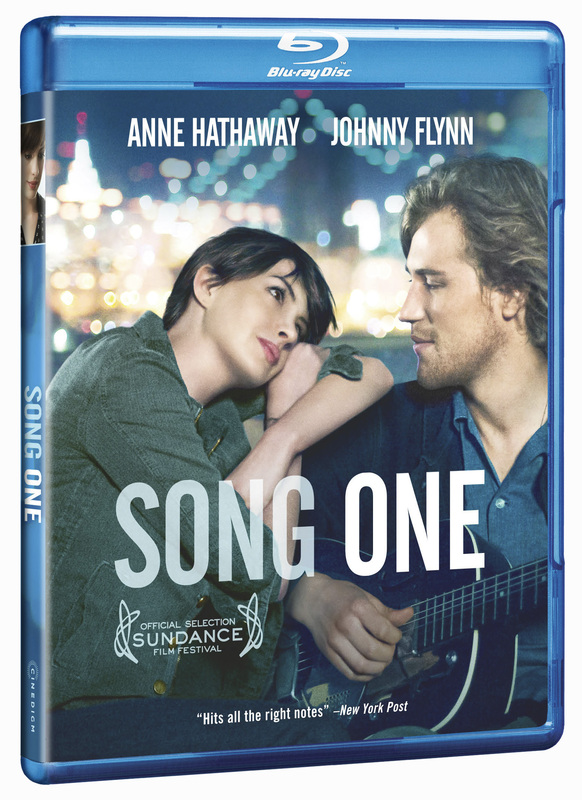 Los Angeles, CA – Academy Award® winner Anne Hathaway (Les Miserables, The Devil Wears Prada) and Johnny Flynn (Something In The Air) star as strangers who connect under unlikely circumstances when Song One releases on Blu-ray and DVD March 24 from Cinedigm (NASDAQ: CIDM) and The Film Arcade. The film has been available on Digital HD since January 23. Set against the backdrop of Brooklyn, New York’s vibrant music scene, the “delicate drama” (Variety) is written and directed by first time filmmaker Kate Barker-Froyland and produced by Hathaway and Jonathan Demme (Silence of the Lambs). Also starring Academy Award® winner Mary Steenburgen (The Help) and Ben Rosenfield (“Boardwalk Empire”), Song One features original music composed by indie duo Jenny Lewis and Johnathan Rice, with live performances by a vast group of popular artists within the thriving New York music community, including Sharon Van Etten, The Felice Brothers, Paul Whitty, Naomi Shelton and the Gospel Queens, Cass Dillon and Lola Kirke. Franny (Hathaway), a PhD candidate in anthropology, has not spoken to her brother Henry (Rosenfield), a struggling musician in Brooklyn, in six months because she strongly disagrees with his career choices. However, when she receives a phone call that Henry has been in a terrible accident leaving him in a coma, she returns home to her estranged family to mend the broken wounds. Unsure if Henry will ever wake up, Franny uses her brother’s journal to indirectly try and understand his world. While learning more about her brother’s life by visiting the local music hotspots he frequents, Franny finds love in the least likely place, a musician (Flynn). Song One is packed with bonus features, including behind-the-scenes recording of the soundtrack and deleted scenes. Additionally, music from the film is available on the Song One soundtrack, from Lakeshore Records. The Song OneBlu-ray Disc will be available on Amazon.com exclusively for the first 90 days of its release. Cinedigm is a leading independent content distributor in the United States, with direct relationships with over 60,000 physical retail storefronts and digital platforms, including Wal-Mart, Target, iTunes, Netflix, and Amazon, as well as the national Video on Demand platform on cable television. The company’s library of over 52,000 films and TV episodes encompasses award-winning documentaries from Docurama Films®, next-gen Indies from Flatiron Film Company®, acclaimed independent films and festival picks through partnerships with the Sundance Institute and Tribeca Films and a wide range of content from brand name suppliers, including National Geographic, Discovery, Scholastic, NFL, Shout Factory, Hallmark, Jim Henson and more. Additionally, given Cinedigm’s infrastructure, technology, content and distribution expertise, the company has rapidly become a leader in the quickly evolving over-the-top digital network business. Cinedigm’s first channel, DOCURAMA, launched in May 2014, and is currently available on over 200 million consumer devices including ioS, Roku, Xbox and Samsung, with additional platforms currently being rolled out. Earlier this year, Cinedigm also announced plans for CONtv, a Comic Con branded channel, in partnership with WIZARD WORLD, for launch in Q1 2015. The Company also announced its third OTT channel via a partnership with The Dove Foundation. DOVE MOVIE CHANNEL will be a digital streaming subscription service targeted to families and kids seeking high quality and family friendly content approved by Dove.